Hours: The Arboretum is open from 9am – 6pm throughout most of the year, with earlier closings on specific months. The grounds are closed on Thanksgiving and Christmas, with shortened hours on Christmas Eve. This is a paid admission Arboretum. These collections contain plant life from regions of Asia that are traditionally rich in flora such as Western and Central Asia, as well as Korea, Japan, and China. The three latter countries have grown to be unusually rich in native plant life because, unlike most of Europe and North America, they were not subjected to the effects of glaciers sweeping across the continents, causing widespread decimation of many plant species. As a result of this richness, explorers have been drawn to these regions for the last two centuries, documenting and collecting numerous native species, and then introducing them into different parts of our western culture. The Morton Arboretum has been a participant in many expeditions to the Far East to bring back exciting new species of trees and plants. The trees and shrubs in these collections are the same species that once covered 80-90% of Europe. They consist of plants that are native primarily to northern and central Europe, including from countries such as Finland, Sweden, Norway, Poland, Hungary, Switzerland, Belgium, France, Germany, and Austria. These two collections are among the oldest plants and trees in the Morton Arboretum, dating back to 1925. North America is the world’s 3rd largest continent, covering roughly five percent of the surface of the planet. The varied topography, coupled with the large temperate climate makes for a land with many unique and distinct habitats that are capable of supporting a rich abundance of flora. The Morton Arboretum has invested years in trials with various plant life originating in regions all around this vast continent. They have found a diverse collection of plants that can not only perform well in the Illinois soil and climate conditions, but also have proven themselves to be of great value in the areas of conservation, education, and aesthetics. This one acre collection in the Morton Arboretum contains over one hundred and twenty seven varieties of trees and shrubs that are noted for their small stature, even at full maturity. This site, which once served as a nursery, now has been transformed into an educational resource for the urban grower. The demand for smaller plants that can thrive in limited space has never been greater. This amazing resource features examples of evergreens, shrubs, trees, and woody perennials that are the ideal addition for the gardener looking to do the most with limited space. The Hedge Collection at the Arboretum is an exceptional resource for the home gardener and professional grower alike, who are seeking information on the various types of shrubs and trees that can be grown to form hedges. This collection was first planted in 1934 and it is thought to be the oldest planting of continuous hedges in any public garden in existence in the United States today. The combined collection contains over 58 different variety of plants, displayed in both sheared and unsheared exhibits. This meadow is primarily a testing ground for the Arboretum, where they evaluate new and underused plants, including shade and ornamental trees, woody shrubs and evergreens, roses and ornamental grasses, as well as perennials. These plants are tested on their resistance to insects and disease, their hardiness to the weather, as well as their mature sizes and important attributes such as fragrance, bloom color, and the fall foliage color. This four acre wonderland is a family favorite and engages children and adults alike. Families can come to the Arboretum and learn about nature in an outdoor, playful environment. Guests of any age can enjoy the activities in the garden year round, including many seasonal programs and highlights. 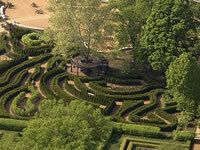 The one acre hedge maze at the Arboretum is sure to excite the young, and the young at heart. Find adventure as you wind your way through this maze that changes from one season to the next. Mazes have long stimulated mankind’s imagination, and have been the stories of many myths and legends throughout various periods of our history. If walking the maze isn’t your thing, you can climb up onto the 12 foot lookout platform and watch your family and friends try to find their way out of the maze. This garden was originally planted in 1938 at the Morton Arboretum Lisle Illinois, and consists of more than 350 different varieties of plants. The Ground Cover Garden is planted primarily with perennials that are mixed in among the woody shrubs and trees. Each plant is carefully chosen for its ability to complement the plants around it, as well as its own contribution to the garden. This quiet little garden is tucked away from the high traffic routes and main visiting areas, right next to the Sterling Morton Library. The reading garden at the Arboretum in Lisle Illinois is open seven days a week and can be accessed either through the library, or an entrance gate on the northern side, leading from the main garden. The Four Seasons Garden is a formal garden located just outside the educational center. More than 70 varieties of plants are displayed in this small, 2000 square foot garden. The central feature of this garden is a circular planting bed that is changed from season to season, to further illustrate the seasonal nature of this site.